Just recently Lorenzo Zanni, head of insight and analysis at the manufacturers’ organization, IABM, hosted a webinar “What will your customers be buying in 2019 and why?” The session was a sneak peek at the upcoming IABM Buying Trends report and looked at predictions for 2019 technology purchases, what is changing, and how broadcasters are reacting those changes. Drivers for change are the impact of new media and the OTT companies on audiences. With a global reach and large budgets these new entrants are creating pressure on the legacy broadcasters. To survive, the broadcasters are also launching direct-to-consumer offerings. Another issue for broadcasters is how to remain relevant to younger viewers. Going direct to consumers entails embracing multi-device delivery, although most leading broadcasters have addressing this issue over the last decade. The response to companies like Netflix has been collaboration between broadcasters and the widening of their reach to a global audience. Content rights will however present an issue. Zanni observed that media companies are becoming media factories, aiming to maximize asset utilization and optimize workflows. The media factory concept calls for a change in culture. The technical infrastructure needs to be more agile, and this leads to the flexibility available using a cloud architecture. Vendors are seeing increasing adoption of cloud storage and processing with AI set to follow (most AI algorithms are available on cloud platforms. This move to agile cloud systems is leading to declining capital expenditure (CAPEX) levels and a move to operational expenditure on services (OPEX). The transition to OPEX is going to affect vendors. Their customer profile is shifting to be service companies rather than the end-user broadcasters. The use of public cloud is still small, with private cloud being more popular. 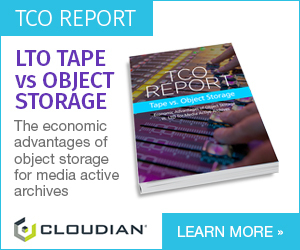 Since broadcasters and media companies have a long history of running their own content repositories, this is not surprising, but another factor is the size of media files and the associated transfer costs of moving files back and forth to a public cloud. The potential savings of using off-the-shelf cloud services however, may not be wholly realized. Many broadcasters cannot find products off-the-shelf that meet their needs so are developing bespoke solutions. The nature of the media business does mean that the requirements on IT systems can be demanding: real-time streaming and huge file sizes are just two differentiators. Content management is the top area for bespoke solutions and requires a high degree of customization. Microservices are popular architectures for building bespoke services. IP and cloud are enabling new business models like remote production. The elastic nature of the cloud accelerates the launch of new services, and already major players are using cloud playout. One audience member raised a question asking if remote production achieve real cost savings. Zanni replied that most trials of remote production have been by larger broadcasters, with the aim of provided more coverage of large events rather than overall cost savings—doing more for the same money. Immersive formats are finding applications in sports broadcasting with Virtual Reality (VR) and Augmented Reality (AR). AI and machine learning are relatively new offerings but already broadcasters are looking at applications. Going global raises the issue of localization, dubbing and subtitling in other languages. This labor-intensive process is one area where AI shown promise, with automated speech-to-text and language translation, and it is predicted that broadcasters will be looking at AI as a potential cost-saver in this area. As part of the webinar Zanni had a guest broadcaster to give a customer’s perspective. Richard Waghorn is Director of transformation and technology at RTE, Ireland’s national public-service broadcaster. Part funded by a license fee, RTE is typical of many members of the EBU. Without the same profit motive as a commercial organization, their attitude towards investment will differ from a commercial concern. In contrast to a general shift from CAPEX over OPEX, RTE prefer capital projects. The use of OPEX for systems puts pressure on the program budgets. This is by no means a universal preference, with many media businesses opting for OPEX with its inherent agility. RTE is not structured with the ability to carry out their own capital projects so prefer off-the-shelf systems. These also allow change to be forced through as opposed to bespoke solutions tailored to meet existing workflows. Their primary aim is to gain value for money, not the lowest cost solution, plus the broadcaster has to follow the EU procurement rules. Zanni asked Waghorn if AI would help with pressure on budgets, “Not yet, but we expect to see benefits in the future.” Looking to set up a digital content repository, the company is experimenting with Microsoft Visual Indexer. This is a cloud application built on Azure Media Analytics, Azure Search and Cognitive Services. Zanni’s moved on to the cloud. RTE uses a hybrid cloud. They have on-premise private cloud, called Nebula. By consolidating existing storage, they have seen efficiencies and energy savings. They use public cloud for email, script writing and workflow management, notably all small files to transfer, as opposed to large media files. To learn more read the full report, with analysis and statistics illustrating these trends in technology purchasing.